Seattle is routinely ranked as one of the most active cities in the country, a stat that’s not surprising when you dig into all the varied athletic offerings. Get a workout with these activities that are so fun, you won’t even feel like you’re working out. 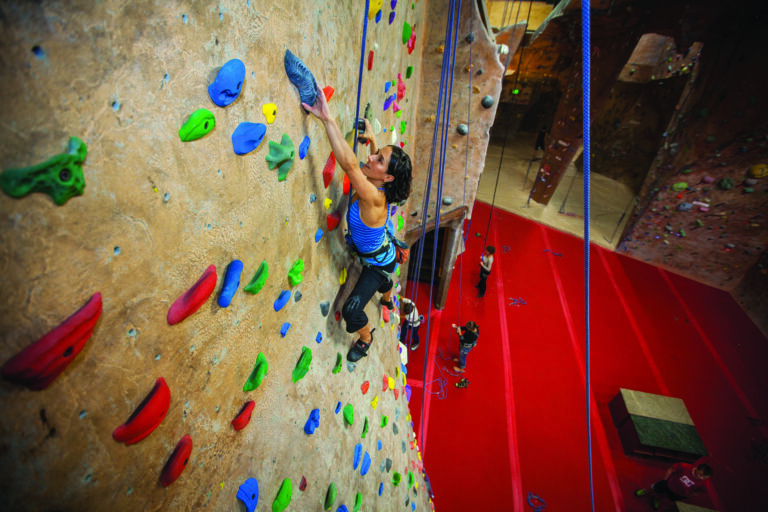 All the mountains in the Pacific Northwest make climbing a treasured pastime. Get some elevation indoors at climbing gyms Stone Gardens (2839 NW Market St; stonegardens.com) in Ballard or Vertical World (2330 W Commodore Way; verticalworld.com) in Interbay. The flagship REI (222 Yale Ave N; rei.com) in South Lake Union also has an indoor wall to tackle—one 65 feet tall—between browsing for outdoor gear. If you’re a true daredevil, Beacon Hill’s open and airy Seattle Bouldering Project (900 Poplar Pl S; seattleboulderingproject.com) trades in ropes and belaying for boulders to free climb without a harness. Even if you’ve never dreamed of running away and joining the circus, you’ll want to run to Georgetown’s School of Acrobatics and New Circus Arts (674 S Orcas St; sancaseattle.org), which offers classes in flying trapeze and circus basics like trampoline, aerial, and juggling. Nearby Emerald City Trapeze Arts (2702 Sixth Ave S; emeraldcitytrapeze.com) will also get you ready to hang from a bar upside-down and take a flying leap to one of the professional catchers. If you’ve ever watched American Ninja Warrior or seen YouTube videos of daredevils jumping in between buildings, you’re familiar with parkour. At Parkour Visions (2600 Airport Way S; parkourvisions.org) in SoDo, you have the chance to try it out yourself—on a less death-defying scale. A free first-timer class introduces you to this indoor playland, suitable for kids and adults alike, where you can practice jumping, vaulting, and running up walls. No matter the weather, the indoor volleyball courts at Sandbox Sports (5955 Airport Way S; sandboxsports.net) in Georgetown will get you in the sun-and-sand spirit, even in the middle of winter. Bonus: kids 5 and younger can come play with shovels, pails, and small slides on Mondays, Wednesdays, and Thursdays.